100% aluminum - sturdy and never rusts! The Naked SUP is the ultimate rack for your paddleboard. 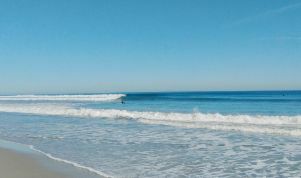 It is both functional and aesthetically pleasing, with a minimalist approach, disappearing into the background and letting your SUP take the spotlight. Display and show off your SUP, not the rack! 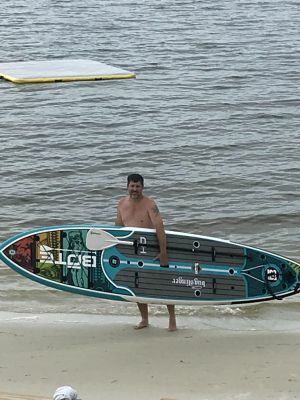 If you're looking for a lightweight, affordable, and non-intrusive way to show off your favorite paddleboard then the Naked SUP is an excellent option. The Naked SUP looks minimalistic but the construction is rock solid to support your SUP. The Naked SUP rack arms are made from a single piece of aluminum that have been custom cut and bent. 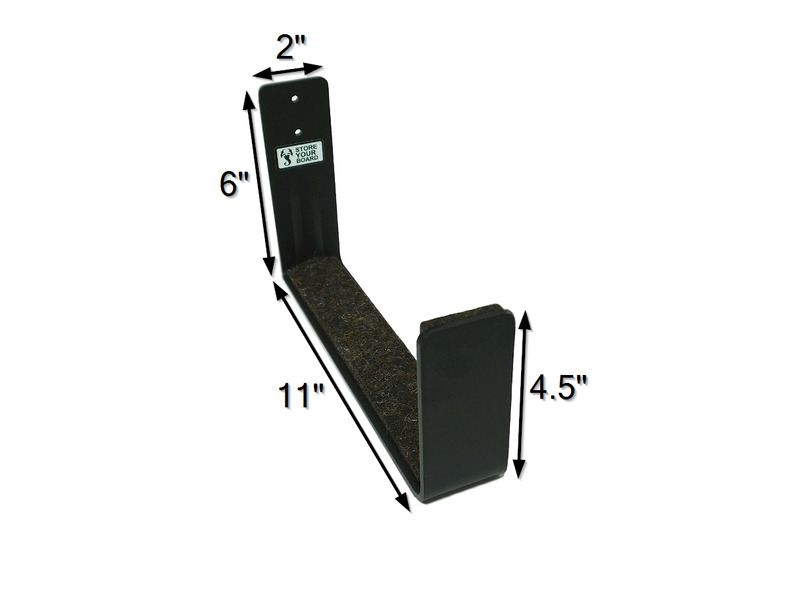 Each rack arm has two pre-drilled holes that allow you to mount two screws in a single stud. The combination of all-aluminum construction with the 2-screw mounting pattern makes the Naked SUP incredibly sturdy for its size and appropriate for a majority of SUPs on the market. The rack arms have been "pre-bent" slightly above horizontal so when a heavy SUP is loaded the arms do not sink below parallel with the floor, a very secure design. Lining the inside of each rack arm is a thick piece of felt padding. This provides a soft place to rest your paddleboard and prevents any long term pressure point distortions. The Naked SUP is offered in a sleek matte black powder coat finish that looks great and is very heavy duty. Even though the rack is mostly hidden when displaying your paddleboard, we have still gone the extra mile to make what little that does show look awesome! -The Naked SUP works well with most inflatable SUPs. We know it can be a hassle to constantly inflate and deflate them. 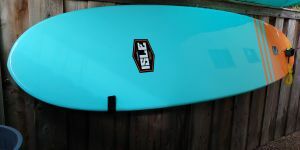 -The Naked SUP is NOT meant for touring boards, they have too wide of a hull and the geometry to lean the board back against the wall does not work. 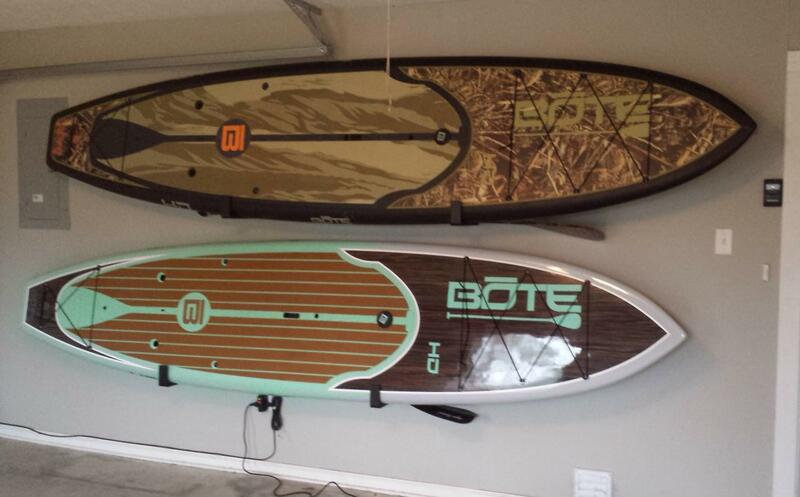 The Naked SUP is our newest addition to the Naked Rack lineup. It took the longest to develop due to the size and weight of paddleboards. 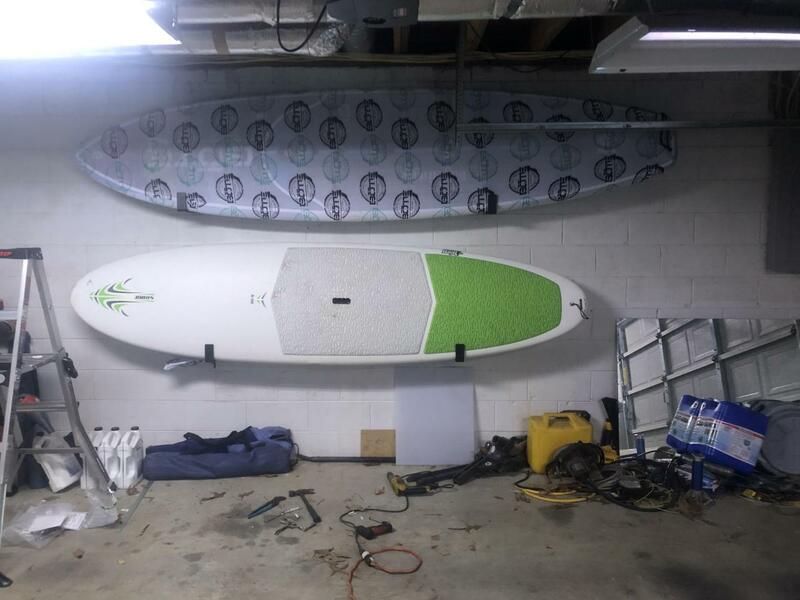 It is one thing to make a rack to hold a skateboard or short surfboard on the wall and it is another thing to hold up a 50lb SUP that is 12ft long. We introduced a new strengthening rib that adds a lot of rigidity and strength while keeping the rack as low profile as possible. Everyone who has seen the Naked SUP in action is pretty impressed with how cool it looks, your SUP basically floating there on the wall. One of the really strong points of the Naked SUP and the Naked Racks lineup is their simplicity. Keeping it to the basics makes for a really strong, yet minimalistic rack. This is the magic combination of looks, functionality, and price that our customers are looking for. Get yours today! PS - do me a favor and tell your SUP crew to get one too! Spacing between the 2 mounting holes on the rack arm: 1"
Diameter of the mounting hole: 3/16"
Hey! This is Josh from StoreYourBoard, here today to talk to you about the Naked SUP Rack for standup paddleboards. What we get is these two arms. You have four screws to mount it to the wall, pop through the holes like that, and an instruction sheet. The Naked SUP Rack is part of our Naked series. Basically what it is, is a compact sturdy rack that tries to be as minimalistic as possible. 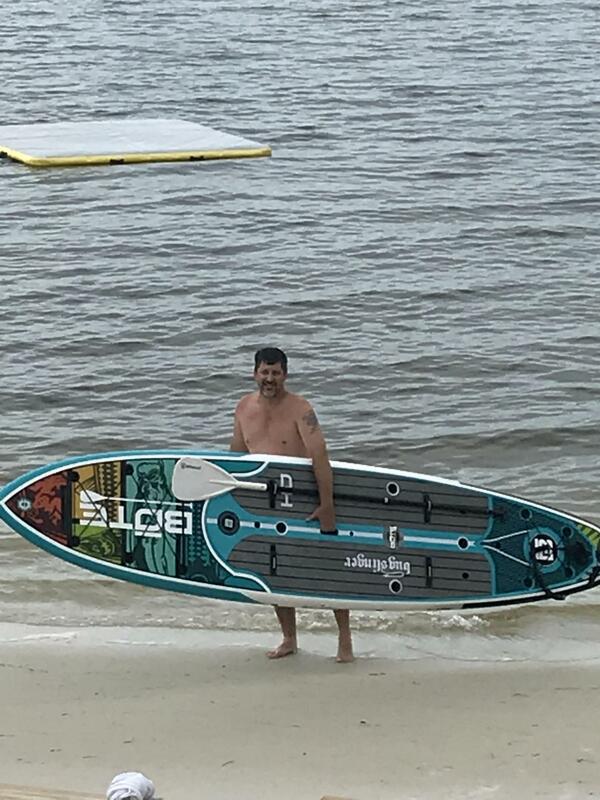 You can see it mounted behind me with the paddleboard in it. The racks are holding the big paddleboard just fine and it’s very minimalistic doing its job, displaying the board, and also storing it at the same time. What you get is these two rack arms. They’re made from aluminum. Then we put a very nice powder coat on it that’s matte. It looks great, doesn’t show fingerprints. It doesn’t scratch very easily. After that, they put a very thick piece of industrial felt on it, nice and thick but also dense so that it protects your board edge nicely. When you lay it on the rack, you have no scratching, no excuse with long-term storage, anything like that. For the Naked SUP Rack, it’s actually our biggest Naked Rack. We have some for snowboards, surfboards, and whatnot but the Naked SUP is for the biggest paddleboards, heaviest, longest, anything like that. The key thing that you’ve done is we’ve actually put a strengthening rib in them. This is one that is not finished powder-coated or put in felt, but as you can see, there’s a rib right in the center there. What that does is it has a lot of rigidity and a lot of strength to this rack to be able to hold the bigger boards. The other thing that we’ve done is we’ve bent it so that it’s just up off of parallel with the ground such that if you do put a really heavy board and it bends just a tad bit, it’s still level and still looks nice. Here it is behind me. I’m going to take this down to kind of show you what it is. The other really cool thing is you can just put your paddle right behind. It looks great. No problem, so we’ll take that down as well. When you’re going to install it, you know you get two separate ones. The cool thing is you can mount them as wide or as close as you need it, based on your board, based on your mounting space. I have these mounted about 4 feet apart. Our board that we’re using today is about a 10-footer, so you don’t want to have it mounted way, way on the end but you don’t want to mount them right beside each other either. You also want to think about how high up you mount them. Basically you want to be able to lift the paddleboard on and lift it off easily. You got to worry about if there’s anything below or above you as far as different things that will get in the way. In general we have a couple of guidelines for the type of paddleboard that we want to mount on this. We say up to 50 pounds. These things are pretty rock solid potentially over that but 50 pounds is good to go by, 36 inches wide. Once it gets too wide, the angle about kind of leaned back, starts to get not as big and we’re worried about it falling out. Then also boards 6 inches thick and less. Some of the Touring boards displacement hulls, they get really, really wide. These unfortunately is not the rack but it fits a lot, a lot of boards out there and looks great doing it. When you do it, you want to try to definitely hit the studs. If you were mounting into a drywall stud-backed wall, studs are 16 inches on center typically so go into divisible number of 16 to try to mount it. If you need to use drywall anchors, get something rated to the weight of your board so that you know that it’s going to hold it. We really recommend studs or something else that’s firmly in the wall. Basically this is what it looks like. All you do is mark it and then you drill it and then you put your screws right in like that. Once you have it, you kind of want to push down on this, rock solid like I said. 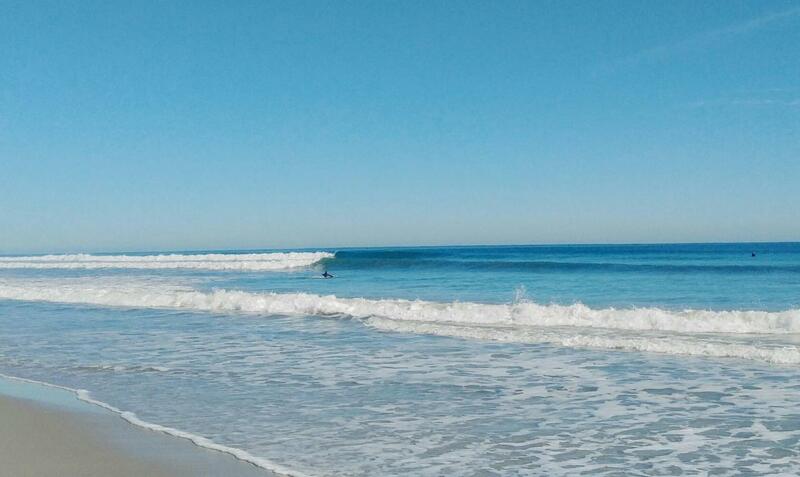 Grab the board. Put it up in the front right like that. Just kind of gently. Lean it back. There it is. The Naked SUP Rack from StoreYourBoard. Check it out. 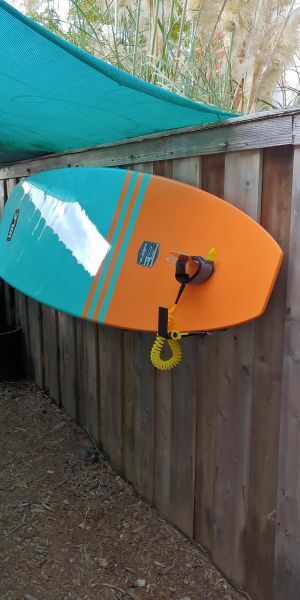 I have an inflatable board and wanted to know if this rack would work for it. I am concerned about the metal edges of the rack. 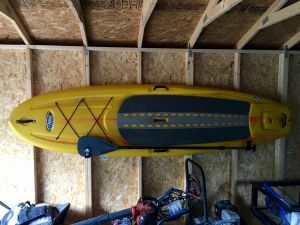 Because some inflatables are coming in really large or different sizings than traditional boards, we would suggest you look at your board's dimensions based on those specifications, and if it falls in those guidelines, it should work fine. Can this be used to hang a board vertically instead of horizontally? Our Naked SUP rack can only be used to hold a SUP horizontally. Because of their size, weight and shape, there really aren't that many wall options to store a SUP vertically, so I don't have a good alternative to suggest for you. However, if horizontal storage is an option for your space, the Naked SUP is a strong, affordable board rack at a great price. Can this rack hold a SUP with the fin side facing the wall and keeping the fin in? Our Naked SUP won't work for a SUP with the fin facing the wall - there really isn't enough room. The rack arm is about 11" inches long, out from wall, but the thickness of the SUP uses up some of that room, and then the board leans against the wall at an angle, which means there isn't that many inches left between the wall and the SUP for the fin to remain in. It is otherwise a great, economical rack, perfect for most SUPs. I have posts I want to mount this rack to that are 8 feet apart, will that work with this rack? The images all seem to be spaced much closer. 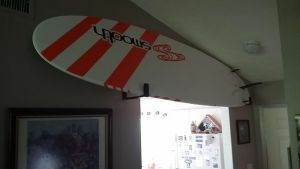 My boards are 11 and 11'6"
With our Naked SUP rack, you mount the arms at a distance that will work to support the length of your board and distribute its weight properly. Usually you go by where your studs are, first, and then how long your boards are. You then set the individual arms at about either 1/4th or 1/3rd of the way in from the ends of your boards. 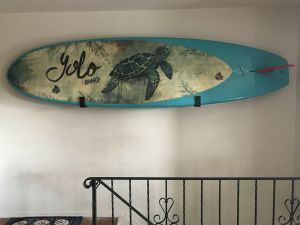 For a board that is 11 to 12 feet long, if you set it up between those 8 foot posts, you will have 8 feet of your board between the arms, on the inside, which may be a bit too much in the middle, for the weight to be distributed well, as only about 1.5-2 feet would be on the other sides of the arms. So, yes, ideally you would want the rack arms in a little bit closer than 8 feet apart for boards that long. You can find some mounting guidelines here, to maybe give a clearer idea of where to position the individual arms. Having 8 feet in the middle could work for your boards, but it would be close, and not as stable as placing the arms just a bit more towards the middle. I have a 9ft Slingshot sup, Would it fit on the naked rack? Our Naked SUP rack should work for your Slingshot SUP, based on the available specs for it. The Naked SUP rack can support a board that long (9 feet), because you can set the arms up as far apart as you need to, in order to support a board's length... you just need a wall space longer than your SUP. It can also support a board up to 6 inches thick, and since the Slingshots appear to be about 4.5" thick, that should be fine. The width of 29" should also be fine. As long as your board is under 50 lbs in weight, it should work well! Can I mount the arms to a concrete wall? Yes, our Naked SUP can be mounted to a concrete or brick wall, but you would need to purchase brick/masonry anchors, such as TapCons to do so, from anywhere that you buy hardware (Lowe's, Home Depot, etc. ), as it ships with standard mounting hardware only. You can find some additional general guidelines about mounting wall and ceiling racks here. How long are the screws that come with the rack? They are approximately 1 5/8" long. Can this fit a 9'2" longboard? This rack has a maximum weight of 50 lbs. or less. 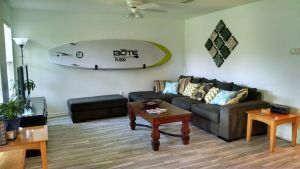 It is definitely wide enough to accommodate any surfboard you would want to put up but the board would be angled more steeply towards the wall than if you used the smaller Naked Surf variety. Saw these online and decided to order them because they showed Bote boards on them and since I have a Bote HD Bugslinger 12 foot I wanted to try them out. They were easy to install and holds the boards very well I like the fact you can keep the paddle with them. Affordable, fast delivery, easy installation, and holds my 9'0 SUP perfectly. The arms are deep enough to enable the board to lean back towards the wall such that it is stable and secure. Love the rack. Easy to install. Look great and doesn't take away from the board. Sturdy. The felt on the racks is great. Would suggest having it on the very tip of the rack if possible but that is only because I am short but needed to put the rack high. So I occasionally need to balance the board on the edge of the rack before flipping it in but that wont be the norm for most people. The rack is great! makes storing your board very convenient. 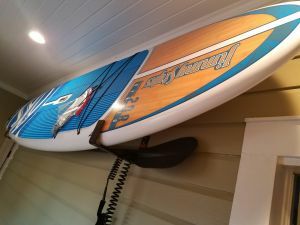 A perfect way to mount your sup or surf board on a wall or fence. I mounted mine on my fence on the side of my house as it is easy to grab and load into my truck. I am greatly pleased with this paddle board rack. It is sturdy and holds well. I have a 10'7'' YOLO SUP. I was super impressed that the naked rack securely cradled it on my living room walls. Great piece of art now that I can easily display! Easy to get off the racks too. I even fit my paddle behind the board so it's all together. These are great for me! I needed something strong and straight forward, that looked great, and I could not be happier. Thanks! These went up easily and work like a dream. Boards are out of the way and they look great on the wall. Would buy again. Quick install, holds my big boards very well. Highly recommend for anyone interested in keeping their boards out of the way and safe! Easy installation. Very happy with product and the fast shipping. Easy Installation and perfect for SUP boards! Simple, easy to install, good quality and sturdy, comes with appropriate hardware which is nice. Was quick to ship and delivered which was awesome. It works perfectly!!! Great quality, very happy with our purchase. Thank you!!! 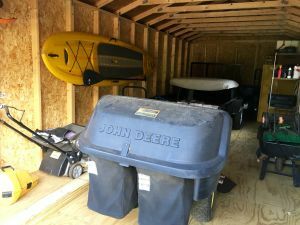 This rack is exactly as it seems - I use it to store my 11' Pau Hana board in the garage and it works perfectly. Easy installation as well. Needed floor space and had a limited wall space for my boards. This worked perfect for me. Very happy with my purchase. Hopefully I'll have better luck with aluminum. This is my final effort with your products. This product works great. We wanted something that could easily be put in and removed when wanted and this product does that. This board rack was easy to install and functions well....definitely falls in the category of "keep it simple"
Shipping was fast and the product comes with everything you need to hang it. Locating studs is the hardest part so a stud finder will help if you have one handy. Simple Straight forward. Does the job right. Simple and minimal. Great product. Thank you Store Your Board for the Naked SUP rack! As you can see it displays my paddleboard quite nicely. The rack pieces were so easy to install and the directions that came with it were crystal clear. Thanks again! Keep up the great work! Exactly what I was looking for - super happy with my purchase. Great product. Sturdy and well designed. Easy to hang. Protects board well. Stores my board easily and out of the way. Easy install! I was wondering what I would do with my SUP when I moved into a different space. 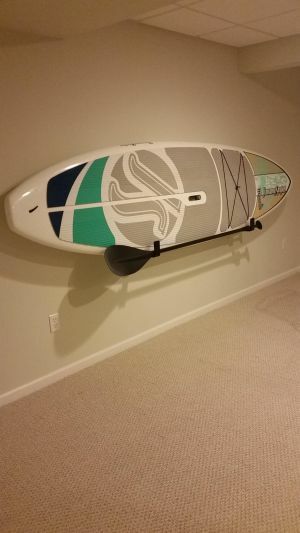 I mounted my board on the Naked SUP rack high and in a hallway. Not only is it easy access to the back door, but it also looks cool on an otherwise useless wall. I purchased these brackets because I live in a small apartment and could only mount my board on the wall. They arrived quickly and are great quality! Very happy!! We wanted to mount our SUPs efficiently while also using them as a display piece, when not in use. The Naked SUP was a perfect solution. It is simple to install and comes with everything that you need. The boards can be placed/removed by one person if need be. There is sufficient room behind the board to place multiple paddles. Because of the design, there is a lot of flexibility on where you can place the mounts. I would highly recommend this product for SUPs. Racks were just as described and great size for our boards (large). Very durable and help to maximize space in our small garage. Easy to install and fast delivery! Great rack! Sturdy, quality appearance. Mounted to studs in my out-building so install a breeze. Longevity to be determined but I love the rack. Thank you! As advertised this product works great. Worth the dollars. Quality product that was easy to install. 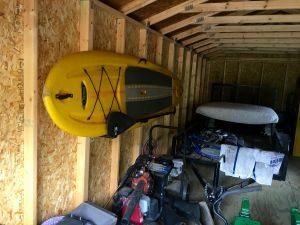 The Naked SUP rack is super easy to install, looks great, and keeps our boards safely off the floor. Well worth it! Simple design and installs easily. Exactly what I was looking for in price and function. Very sturdy and easy to hang. Bought one for my surfboard too. I needed a product that could withstand outdoor conditions including saltwater. This product was a perfect fit! Rack is perfect, holds my sup, keeps it out of the way and it looks great on the wall too! It was easy to put up and works great! It's also a great way to show my board and make the room look organized. Love the Naked/minimal SUP rack, my Starboard looks great in it! I have the naked surf rack from StoreYourBoard already so I thought I would try the SUP version out for my new board. Wow this thing is heavy duty! I thought the surf rack was strong, this has way thicker metal and no problem holding my SUP. I think the padding is a little thicker as well which is a nice touch to keep my board looking new. This rack was easy to install using the included instructions and hardware. The rack holds the board well, displaying the colorful details, and due to the short end pieces, it is very easy to lift the board off of the rack for use. Definitely recommend this rack for an area where the board will not merely be stored, but also on display. Rack arrived quicker than expected and it was so easy to install. 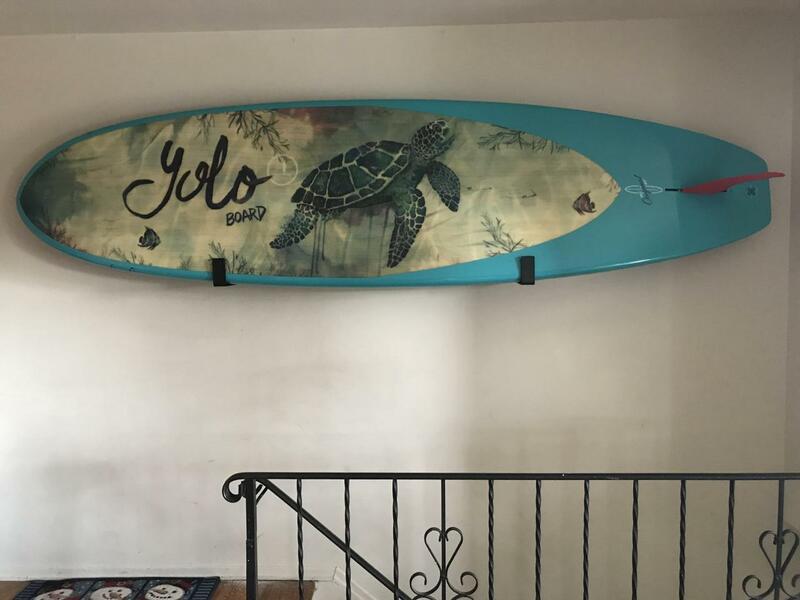 This is great that I can "store" my board but really I like how it displays the graphics on my new Yolo Eclipse board. It is like I just got a new piece of art on the wall!